Your impact on your credit union is strong—and we'll help you achieve an even more elite level. With NAFCU credit union training, you'll receive the best compliance assistance and education available. We'll help you build key compliance knowledge, stay ahead of evolving regulatory trends, and cut headaches. 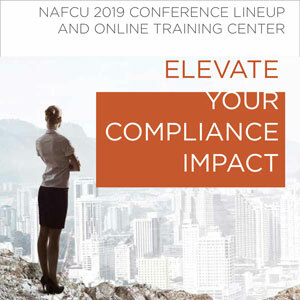 Take advantage of our 2019 compliance conference and online training lineup now. Please fill out your information to download the brochure now.